My book on ancient astrology, titled Hellenistic Astrology: The Study of Fate and Fortune, was released on February 10, 2017. Since the book has been out for a few months now reviews are starting to come in, and I wanted to highlight some of those here, as well as provide some links to some interviews I’ve done where I explain what the book is about. This is not a book for those with weak wrists as it weighs just under 3lbs. It runs to 670 pages and is the result of ten years’ labour. It is not a page-turner, rather a page-ponderer. It is not a cookbook of Hellenistic techniques from which one can simply parrot phrases: it is a scholarly, studious compendium of astrological history. And if you read it carefully, it should lead to a mastery of certain predictive techniques. This book equals any college textbook. Chris’s writing is clear, full of details but no excess. He documents his work with footnotes on every page. Chris is a good teacher and this shows in the book when you read “…the important part here is…” or “In summary….”. Chris never assumes that the reader knows any of this information and takes the time to explain every term, clearly and precisely. He illustrates the techniques with many charts so that the reader can get a visual understanding of the text. This is a serious book. It is a scholarly work with a sophisticated vocabulary. It is a big book, 600 pages, and well worth the effort to read since by the end of the book you will understand Hellenistic astrology and be able to try out some of the concepts. It is rich in information and written from a place of true love for the topic. It’s thrilling to hear that he’s not finished, that there will be more books on Hellenistic astrology to look forward to and more techniques to learn. Techniques are laid out with working examples provided in the latter half of the work. Throughout, Brennan works at keeping the interest through weaving his multiple threads of information into a coherent schematic. I did not find this dry and distant. I found it eminently readable. I would recommend it, even to beginning students. Hellenistic Astrology lays a congruent foundational framework. The cliché is always that a book will become the ‘go to’ textbook on the subject. Chris’s work richly deserves such a recommendation as the standard bearer. It is not only a very thorough introduction to essential concepts of western astrology from the first to seventh centuries – but intelligently deals with the reasoning behind them. If you want to immerse yourself in the study of Hellenistic astrology, make this your launching pad. Being familiar with most of the concepts by searching, analyzing and compiling information from various sources over time, I understood from the first glance the added value that Chris brings to the Hellenistic tradition, which is that for the first time in modern times the fundamental concepts of Hellenistic Astrology are bound together in an unitary and coherent vision, accessible to the general public. Who is this book for? Quite simply, everyone who calls themselves an astrologer, or who wants to be one. Whether or not you intend to practice Hellenistic astrology is beside the point. If you’re a western astrologer, this is core material for your tradition, alongside the Persian/Arabic thread that became interwoven with the Hellenistic material into Medieval astrology and its subsequent evolution/devolution into modern western astrology. Vedic astrologers will profit from reading this too, not that it will challenge their allegiances, but because it will demonstrate so much common ground. Chris has done an admirable job in presenting a large body of core material that does more to unite astrologers than divide us. And in this day and age, that’s a spirit worth nurturing. 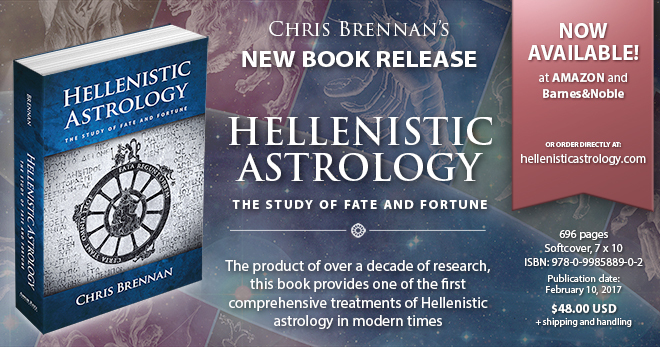 Chris Brennan’s Hellenistic Astrology: The Study of Fate and Fortune is a masterwork that combines history, philosophy, and technique in one very large, extraordinarily detailed, and very readable book. Whether you are a student of astrology, a practitioner of astrology, or just someone interested in the way astrology near its origin point was applied in the lives of real people, you should get this book and study it from page 1 to page 670. The time you spend on it will be well worth your while. I’ll update this list and post snippets from other reviews as they come in.